Teaching metaphors is sometimes difficult. Metaphors are sometimes confused with similes and as if that wasn't enough, it is difficult to get students to be comfortable enough with metaphors to actually use them in their writing. The first step in teaching metaphors is to give a clear definition of what is and is not a metaphor. Metaphors are often confused with similes and therefore, when you are teaching metaphors, it's helpful to teach similes as well. She has the energy of a bunny. The canvas of life is colorful. All of these sentences take ideas that cannot literally be true and use them to convey meaning in an interesting way. You cannot literally have a lion heart instead of a human heart, but describing someone as having a lion's heart is a more eloquent way of saying that he is brave. Consider introducing similes along with metaphors because the two are often confused. Similes compare two unlike things but draw out one common idea between the two. They often include the words "like" or "as" and that is an easy way for a student to distinguish between a simile and a metaphor. In writing, similes are often followed with some type of explanation. One notable simile uttered by Forrest Gump is, "Life is like a box of chocolates. . ." He then goes on to explain that life and the boxed confections are similar because you don't know what might be coming your way. Before you attempt getting your students to use more vibrant language in their writing, it's important to try to get them to recognize a metaphor and how it benefits a passage. Recognition of the use of metaphors is crucial in order for your student to weave the use of metaphors naturally into his own writing. Poetry is filled with metaphorical language. The study of poetry is a great way to help your student find and dissect metaphorical language. Whether you're reading Shakespeare or Poe, it's rare that you will pick up a piece of poetry and not find a metaphor. In fact, teaching metaphors and poetry in the same unit alongside each other is a great way to cover both concepts. When you're choosing poetry to cover, try choosing things that have obvious metaphors. If it's not obvious to you, it probably isn't going to be obvious to your student. Likewise, encouraging your student to write poems is a great way to encourage the use of metaphors. 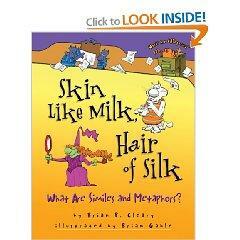 Skin Like Milk, Hair of Silk: What are Similes and Metaphors? gives clear examples of similes, metaphors and the difference between the two. It Figures! Fun Figures of Speech has all sorts of fun language in it, including metaphors. Have your child create a poster that illustrates a particular metaphor that he or she wrote. Having a medium through which to express the idea of something being something else because of its underlying similarities can help solidify the concept of the metaphor. Display the poster prominently or scrapbook the idea for posterity. Teaching metaphors should be looked at as a process rather than a one time unit. It is a concept that can be taught as early as fourth grade (or when the student is capable of writing fluently), but should be revisited each year. Each time you teach metaphors and similar types of syntax, you should delve a little more deeply, encouraging the student to explore on their own.